Home / Blog / Winds of change – can Abiy Ahmed open up Ethiopia? Winds of change – can Abiy Ahmed open up Ethiopia? ‘Stellar’, ‘impressive’, ‘unprecedented’, ‘historical’ – these are some of the adjectives that have been used in the past few weeks to describe the reform agenda that the new Ethiopian Prime Minister, Abiy Ahmed, is pushing for. Since his rise to power in April 2018, following the unexpected resignation of Haile Mariam Dessalegn, Abiy Ahmed – the youngest leader in Africa, first Muslim and Oromo native Prime Minister in modern Ethiopia – has dramatically shifted the direction of Ethiopian politics. In particular he has committed to implement long overdue reforms towards greater openness. Things are changing and they’re changing fast! On the political front, Abiy Ahmed lifted the state of emergency that was imposed in February 2018 when the former Prime Minister resigned amid repeated protests. He also released thousands of prisoners, recognised acts of torture and terrorism perpetrated by the previous regime and restored greater freedom for the media. He has met with opposition leaders and plans to amend the constitution to introduce two term limits for prime ministers. Most importantly, he has made concrete and historical steps to restore peaceful relations with Eritrea – putting a formal end to the ongoing war between the two countries. He has also sought to bring greater transparency within local authorities, as well as powerful security agencies and the army. On the economic front too, the new Prime Minister is setting the path for change. Ethiopia remains one of the fastest growing economies on the continent and seeks to achieve middle income status by 2025. It also aims to be the region’s biggest energy producer with the construction of the Grand Renaissance Dam. Ethiopia’s growth has averaged 10% in the last decade but there are reasons to question the credibility of the available data. There are important challenges ahead as public debt now represents a majority of GDP and inflation keeps rising. This situation may have led the new PM to announce, for example, the long awaited opening of state-owned telecoms and other services to foreign investors for the first time ever – in an attempt to redress the economic situation. So there is a lot to be excited about and extremely hopeful for. These changes are met with a political effervescence that had not been seen in Ethiopia and within the diaspora for a very long time. This was made clear at the demonstration in support of Abiy Ahmed two weeks ago. He has clearly tapped both into society’s aspiration for change, as well as resistance from the old guard, as the unsuccessful grenade attack launched at him at a recent rally reminded us all. What we all need to understand is that building democratic systems demands listening to each other […] we will strongly and steadfastly continue with our efforts to build a democratic system in which the voices of all Ethiopians are heard and everyone is allowed equal participation. So it remains to be seen how that ambitious agenda can also be translated into restoring civil and human rights, ensuring for example that civil society organisations have an active role and can be part of the decision-making process. This could be a challenge while some of the anti-terror and CSO laws implemented post-2005 are still in place. 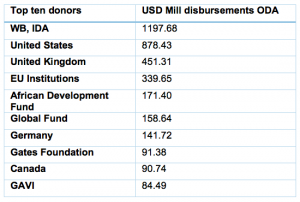 Opportunities for more open and effective aid? 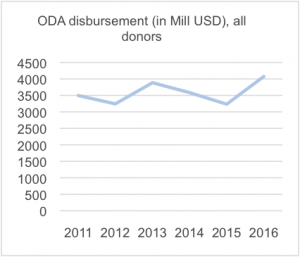 We should also not forget that while Ethiopia has demonstrated impressive growth in the last few years, it still remains of the largest recipients of international aid. It was in fact the largest recipient of ODA in 2016 according to OECD data. The development needs across the country are very real and most major international donors spend very large sums of money in Ethiopia. But the good news is that this reform agenda should also open a window of opportunity to review the way aid and development finance is allocated and distributed. In particular, it should ensure these resources meet those in need and support renewed efforts towards improved development and service delivery. This is where international donors in particular have a role to support the current transition and demonstrate best practice, for example, by sharing information on their current and planned development activities with the government and other organisations. Some of the major donors listed above already do this but performances vary across the board. This could represent a first step to support the sustainability of these changes, rebuild trust among all parties and demonstrate support to widen political space to all citizens moving forward. The stakes are high and this will undoubtedly be a precarious balancing act for the new Prime Minister to perform. But if successful in the long term, there is little doubt that this new reform agenda has the potential to create transformative waves, not only in the country, but also regionally, bringing a much need boost towards openness.